The V-stitch is a pretty crochet stitch that works up quickly. It's a great stitch to know for working on big projects like afghans. But it's also useful for crocheting many other types of projects. 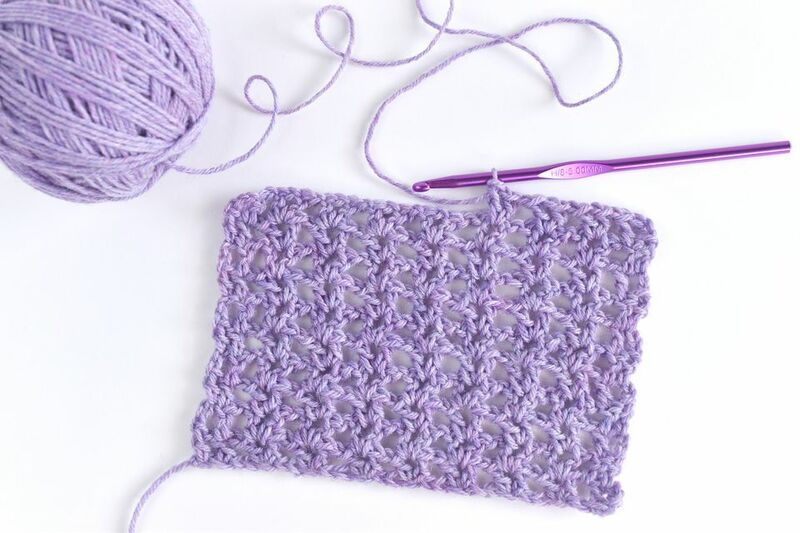 Read through the written instructions below to see how this stitch typically is shared, then follow the photo tutorial for a visual guide to learning this crochet stitch! Once you've finished learning how to crochet the v-stitch, find a simple crochet v-stitch pattern to try, such as this free crochet doll blanket pattern. You can also begin to learn different variations on the classic v-stitch, such as the crochet v-stitch shell. Start with a multiple of 3 + 7 stitches. The V-Stitch: To complete each V-stitch, work 1 dc st, 1 ch st, and 1 more dc st in the same chain or space. Row 1: dc in 4th ch from hook. The last 3 chs count as the 1st dc in the row. Ch 1, skip next ch, [dc in next ch, ch 1, dc in same ch. Skip next 2 chs.] Rep the sequence in brackets across the row. At the end of the row, ch 1, skip 2 chs, then work 1 dc in ea of the next 2 ch sts. Row 2: the turning chain counts as the first dc in the row. Dc in next dc. Ch 1, work 1 v st in ea v st across the row. Ch 1, skip next ch, work 1 dc in ea of the last 2 dc sts. Rep row 2 until the piece reaches the desired length. Secure the last stitch and weave in the ends. Start by crocheting the foundation chain. Yarn over and work a double crochet into the 4th chain stitch from the hook. The first three chains in the row count as 1 double crochet. With the double crochet you just completed, you have the equivalent of two double crochet stitches at the beginning of the row. This isn't the V-stitch, but it makes a nice edge. Skip the next chain, and then work a double crochet stitch into the next chain stitch. This is the first half of the V-Stitch and the chain that separates it at the top. Work another double crochet stitch into the same stitch where you worked the last one. This completes the first V-Stitch. To work the next V-stitch, yarn over the hook to begin the first double crochet in the v stitch. Skip the next 2 chain stitches. Double crochet in the same chain stitch, completing the V-stitch. Repeat the step above to continue working in this pattern all the way across the row. When you get to the end of the row, work a chain stitch, then work one double crochet stitch into each of the last two stitches. This matches the edge at the beginning of the row. Work 3 chain stitches for the turning chain. Turn the work over to crochet the second row, working back across the first row. The turning chain counts as the first double crochet stitch in the row. 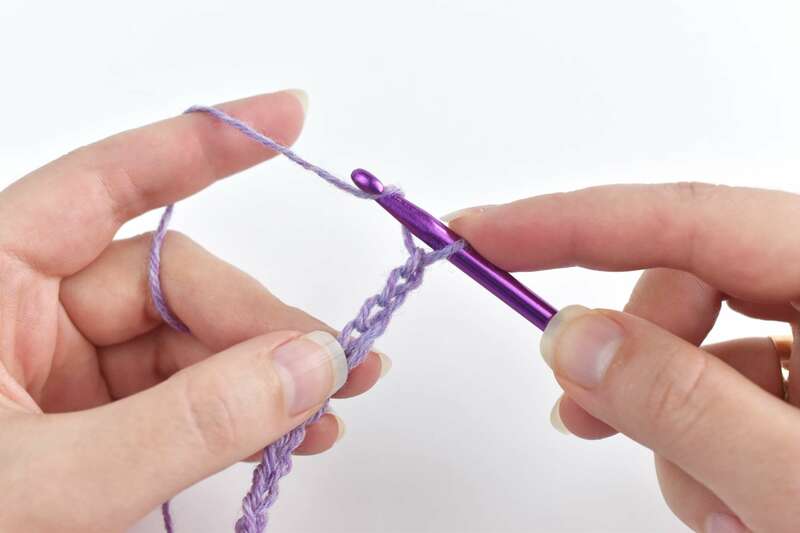 Work a double crochet stitch into the next double crochet. Yarn over to begin the first V-stitch. Each new V-stitch should work into the middle of the V-stitch in the row below. You should place your hook in the space between the V, rather than into the chain stitch. Double crochet in the V-Stitch below. Chain 1. Work another double crochet to complete the V-stitch. Continue working a V-stitch into each V-stitch across the row, then end the row as before. Follow the pattern until the piece is as long as you want it to be.